Uniworld Boutique River Cruise Collection adds the scenic Moselle River to the popular Rhine River cruise on its 12-night “Legendary Rhine & Moselle” itinerary, which sails between Amsterdam and Basel. The River Queen is one of Uniworld’s older ships, and it’s a classic with a 1930s steamship exterior, Art Deco furnishings and attentive Old World-style service. It will again operate the itinerary in 2017, and is a great choice for both new and experienced Europe river cruisers looking for something different. Plus, the line’s three-day add-ons to Amsterdam and Basel make it easy to package a longer European odyssey. The Itinerary: Before sailing down the Rhine, the cruise includes an onboard dinner and overnight in Amsterdam, with a canal tour and a guided visit to the Van Gogh Museum or the Rijksmuseum the following day. The River Queen then calls on Cologne, Germany, for a tour of its Old Town and a visit to the Roman-Germanic Museum or Cologne Cathedral. 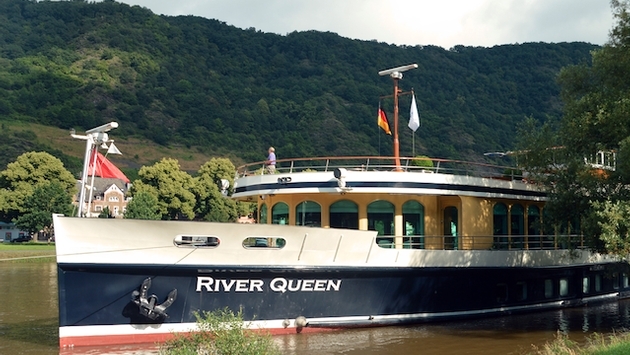 Sailing on the Moselle, the River Queen calls on Cochem, Germany, for a city tour and a trip to Reichsburg Castle in the morning. On an afternoon visit to tiny Ediger-Eller, Germany, guests are greeted by the mayor and attend an organ recital at the town’s church followed by a tasting at a local wine tavern. Next is an overnight in the ancient Roman town of Trier, Germany, a UNESCO World Heritage Site that is the base for a day trip to nearby Luxembourg, which includes a tour of the World War II Luxembourg American Cemetery and Memorial where Gen. George S. Patton is buried. The Moselle town of Bernkastel, Germany, is next. 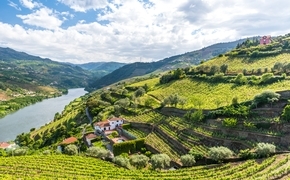 Two optional excursions here include an exclusive visit and tasting at a wine estate or another “Go Active” outing (a flat bike-ride along the Moselle). Bernkastel is also a great place to taste the region’s famed Riesling white wines. Back on the Rhine, the ship calls on Boppard, Germany, for a walking tour, and Rüdesheim for a visit to Siegfried’s Museum of Mechanical Musical Instruments. Speyer, one of Germany’s oldest cities, is next with a city tour or an outing to the Doktorenhof vinegar estate. France’s fascinating Strasbourg features two city tour alternatives, one by canal and one on foot. The final day on the Rhine is spent docked in Breisach, Germany, with excursions to medieval Colmar or to two Alsatian wine villages. Basel marks the end – or the beginning – of this unique river cruise. Most Common Accommodations: Standard staterooms are in Categories 1-5 on three of the River Queen’s four passenger decks and include 60 of 64 staterooms and suites. The standard stateroom is a slightly snug 151-square-foot accommodation featuring handcrafted Savoir of England beds, built-in closets, safes, individual thermostats, bottled water and flat-screen TVs with an extensive infotainment center and satellite service. Marble bathrooms have L’Occitane en Provence products, waffle bathrobes, slippers and hair dryers. Stateroom categories differ by décor and river view — porthole, varied window sizes and French balconies (in the Category 1 staterooms on the Rhine Deck). Fanciest Accommodations: The remaining four staterooms are 215-squarefoot suites with French balconies, butler service and other amenities like stocked minibars free laundry and daily snacks. What’s Included: The river cruise includes 12 breakfasts, 11 lunches and 12 dinners; captain’s welcome and farewell receptions; unlimited beverages on board; 11 days of excursions, including “Choice is Yours” and “Go Active” programs, plus optional tours for an additional fee; portable audio-headset systems on excursions; use of bicycles and Nordic walking sticks; free Internet and Wi-Fi access; all transfers on arrival and departure days; onboard local entertainment; and all gratuities (both onboard and ashore). Entertainment: The itinerary features high-quality local entertainment on several evenings during the cruise. Favorite Excursion: The unusual and exclusive excursion to the Doktorenhof vinegar estate includes a cellar tour – guests wear monk-like robes – and tastes of several premium vinegars made from high-quality wines. What’s for Dinner: Uniworld takes great pride in its cuisine, and this itinerary is no exception. Regional fare and wines are featured throughout the “Legendary Rhine & Moselle” cruise. Target Market: New and veteran European river cruisers ages 55-plus looking for something a bit different. Insider Booking Tip: The Category 1 staterooms on the Rhine Deck are the only non-suite options that offer French balconies. Key Selling Points: Emphasize the inclusive nature of the trip as well as the stunning beauty of the Moselle River and the itinerary’s regional cuisine and wines. A version of this article appears in print in the November 2016 issue of Agent@Home Magazine.